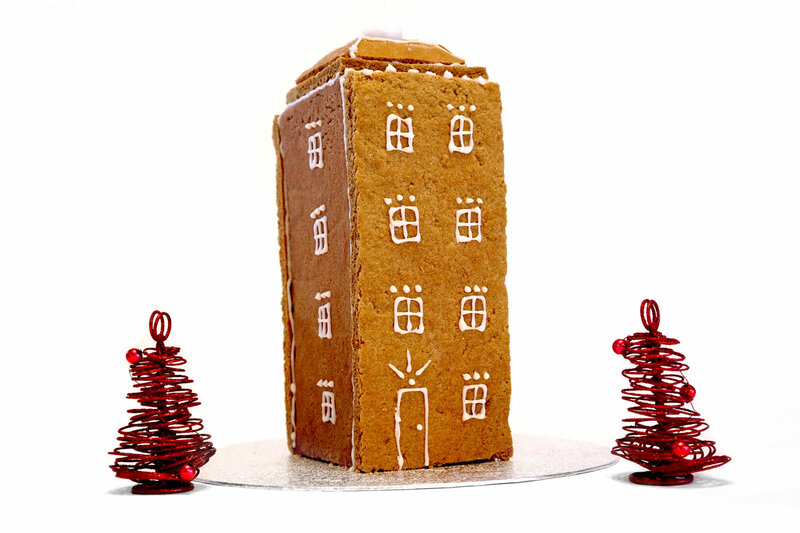 This week we’ve been busy recreating one of Deal’s most recognisable landmarks in gingerbread, all in the spirit of Christmas! The gingerbread is pretty tasty, so once you’ve painstakingly assembled the model you can delight in smashing it up and devouring it. You’ll have more than enough dough to make the model using our printable template. We loved making this and found it so much more rewarding than the usual gingerbread house, and it's not actually much harder but feels a lot more impressive. Heat oven to 200C/fan 180C. Melt the butter, sugar and golden syrup in a pan. Once melted and combined, mix in a large bowl with the ginger, bicarb and flour. Knead the dough for a few minutes until it comes together and is an even colour. You may need to add a few splashes of water to bring it together. Cover in cling film and refrigerate for 10 minutes. At this stage our dough was little crumbly, so we added a little extra melted butter in until it stayed together. Lightly dust your work surface with flour and roll the dough out to the thickness of a £1 coin. You may wish to divide the dough in two. Roll into two large squares and Place the dough on 2 trays lined with greaseproof paper and bake in the oven for 12-18 minutes. The timing will vary, we ended up making two towers, one cooked for 12 minutes and one with 18 minutes, and we preferred the 18 minute cook time as it was a lot crispier to the bite and a richer colour. While the dough is baking is a great time to print off our template and cut out the shapes. 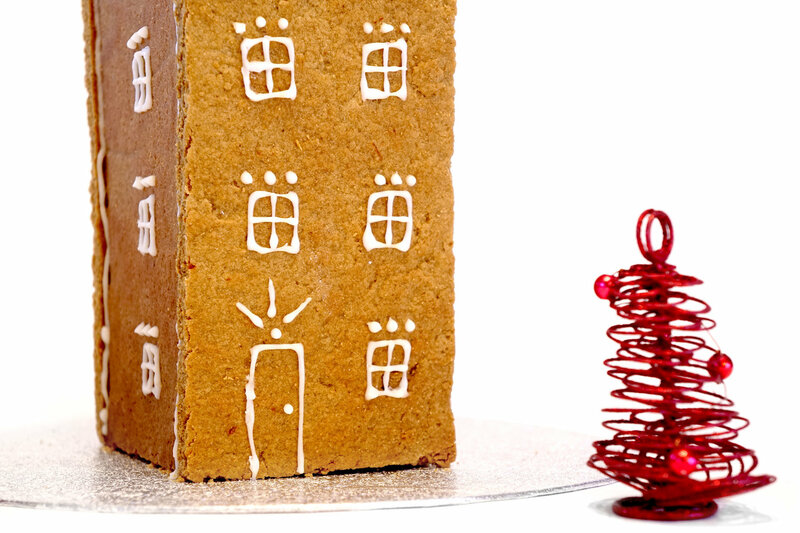 Remove the gingerbread from the oven and begin cutting out the shapes using the template as a guide. You’ll want to work quickly while the biscuit is still soft, the longer you wait the more you risk cracking. Once cut out place the pieces on a cooling rack to harden and cool. At this point we made little triangle to reinforce the build, we haven't put that on the template but it's simple enough to make. Make the royal icing by whisking together an egg white with icing sugar. Keep adding the sugar until you get a toothpaste like consistency. Fill a piping bag with a little of the icing and pipe out doors and windows and any other decorations you’d like. With the remaining icing, use a knife to spread it along the sides of the walls to glue it together. Hold each piece in place for a few minutes before moving onto the next. Once the icing dries it will firmly hold the pieces in place. Pieces will probably fall apart at first but just use more icing and support it as it dries. To make the time ball on top we used a little fondant icing. Take a pice and roll it around in your hands to make the ball shape. For the cross shape, take a cocktail stick and cut it in half, trim the edges and cover in royal icing. Leave to set and glue together with more icing. This bit was a little fiddly so we used tweezers to handle them.